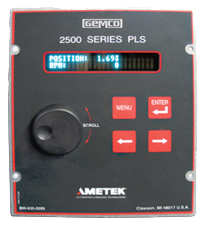 The Gemco 2500 Series PLS is a high-speed resolver based Programmable Limit Switch that monitors rotary machine position and provides discrete limit switch outputs. These outputs are updated at a much faster rate than can be accomplished using any conventional PLC. The 2500 Series uses a unique easy to understand programming sequence. The traditional number buttons have been replaced with a rotary knob and the main controller has a 2 x 24 vacuum fluorescent display along with four push-button keys for programming. The 2500 Series is a family of PLS's that offers unparalleled flexibility. The main controller is resolver-based and consists of 8 isolated DC inputs and 8 isolated output relays, one fault check output relay and one optional brake monitor input relay. This unit can be used with our 1986 Series Resolver Assembly.